"With talent on loan from God..."
If you're an avid talk radio fan, then you know this is a signature line from the king of talk radio, Rush Limbaugh. 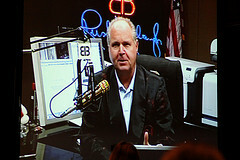 Love him or hate him, I do think that Rush has a basic understanding of why He has been so successful. He has been blessed by the Creator of the Universe with an amazing talent for talk radio. All of us have been blessed by Almighty God with certain abilities, spiritual gifts, and financial resources. He is wanting each one of us to use these skills, attributes, and assets in a mature, responsible way to build up God's Kingdom. God is not wanting us to use these things for our own selfish gain, but rather as the means to accomplish His purposes for our lives and His Kingdom. In my own life, I have recognized that I have several unique abilities, spiritual gifts, and financial resources. Some of these I recognized early on in life. Others came more evident to me later on as I grew and matured. For example, in elementary school, many recognized that I had a decent musical talent, and I have been blessed with several creative outlets to utilize that talent for God's Kingdom. As I have matured and grown in my walk with Christ, I also recognized that I have been blessed with the spiritual gifts of teaching, administration, leadership, and giving. These gifts have developed and flourished as a result of my being called into the ministry. Sometimes, you really don't know what you possess until you start doing something, and then the gifts become evident as a result. Another talent that has developed in my life over the last couple of years is writing. Again, as a result of developing an interesting in blogging as well as writing for some of my church's publications, I realized that I have a knack for crafting some well-written articles. I won't say I've arrived, but I've definitely enjoyed the writing journey up to this point in time. I look forward to seeing how God will use this talent in the future. What Has God Loaned Out To You? So, have you ever carefully considered what God has loaned out to you to use for His glory? Have you seriously contemplated how He has wired you? What do you like to do? What would you do, even if you didn't get paid to do it? I would encourage you to really dig deep and examine your life. See if you can identify your natural talents, spiritual gifts, and resources that God has blessed you with. Think through how you can use these to bring glory to God and increase His Kingdom. Consider how you can benefit the body of Christ through your local church. In this post, I have been making two assumptions. First, that you are a believer in Jesus Christ. You have surrendered your life over to Him and are trusting in Him alone to save you. Second, that you are a member of a local, Bible-believing church. God has created the church for His followers. He understands that we truly do need each other for our individual spiritual journey. Instead of being an occasional pew warmer on Sunday mornings, why not use what God has gifted you with to build up the Body of Christ? It sure is a lot more satisfying for your Christian walk when you're using everything you are for God's glory and Kingdom purposes. Pay back your loan to God with interest. Use yourself up for Him.